The Mask system started as an idea which didnâ€™t seem possible on paper. We said, Let's make a mask for archery with no frame and no nose... so the performance archer has a completely unobstructed visual sight and target reference. 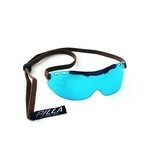 Further, the design of the glasses should provide a feather weight feeling to the lens. 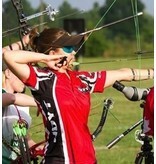 Pilla worked with the #1 Archer in the world, Erika Jones, to refine the concept, and the Mask system has since re-written the book on performance glass geometry. The Mask system is secured using a suede lanyard which can easily be adjusted for pressure using a slide on the backside of the head. 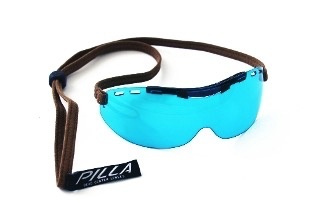 The actual need for tightening to secure the lens is minimal as the Pilla/ZEISS lens technology is so light in weight that it basically sits on the bridge with no pressure from the lanyard. The visual picture is unmatched through the lens, as there is no nose piece interrupting the archer's vision. The lens design is fit with a wide megol sweat bar that promotes air flow from top to bottom, as well as through the front side of the sweat bar. This innovative bar design acts like a frame, providing a very comfortable fixing point to the head, and should be worn so the sweat bar anchors the lens to the face. in addition to the venting system in the sweat bar, there are additional venting holes in the lens that are angled which pushes air down the backside of the lens. This design is to help reduce any fogging in high humity situations.